Excited to be involved in Sarah Beeny’s new show ‘Renovate Don’t Relocate’ we pulled out all the stops to help deliver and showcase a wonderful kitchen for our clients. The new show featured on Really TV channel helps home owners who have become frustrated with their home truly optimise and transform their space. Using full scale floor plans and smart cameras to reflect how people use their existing rooms – Sarah Beeny gives people the opportunity to look at their space in new ways. 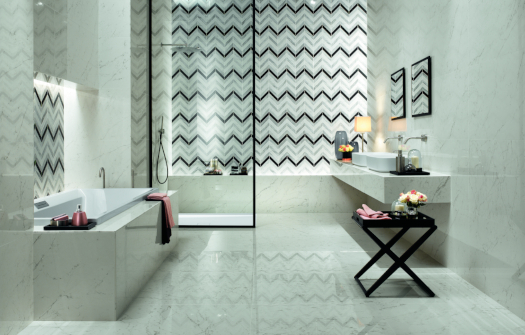 With clever design solutions, tips and tricks clients realise they have more space and can design rooms to the way they live now and in the future. With moving costs so high renovating instead of relocating could be the answer to a better home. With a beautiful character cottage located in a Surrey Village, owners Mel and Iwan wanted to create a delightful home for themselves. Having lived aboard for many years they wished to redesign the dated kitchen and breakfast room which was ruining their enjoyment of their country cottage. The existing kitchen was a 70s addition to their home and nothing had been modernised since. Used almost separately to the rest of the house they desperately needed to inject some modern living and light into this space. After seeing an advert on TV for a new programme looking for properties needing renovation, they applied and were elated to be given the opportunity to be part of the show. How did Sanctuary get involved? The filming schedule required a very quick turnaround from design brief following the analysis of how Mel and Iwan utilised the space to final installation. With a timescale of just a month to complete the whole project Sanctuary were recommended by a local builder. 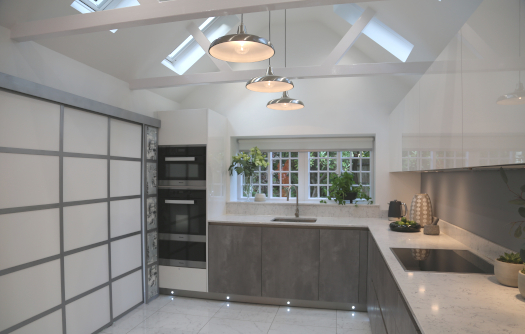 With experience of working with us on previous kitchen projects the builder knew we could meet the timelines and deliver a unique kitchen for them. We took the initial call on a Tuesday, discussed the design brief and product choices at our Showroom with the clients on Wednesday, presented the 3D design and mood board on Friday and agreed contracts on Saturday. 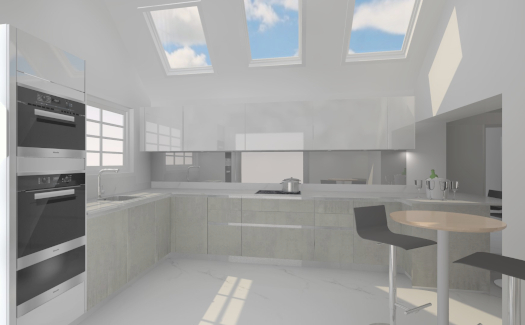 In less than a week we delivered a kitchen design solution that would achieve their desire for modern layout that would also flow naturally as part of their existing home. Our role in the project was to design the kitchen, supply furniture and appliances and install the kitchen once all the building work was completed. Working together with the clients, builders and the television production team was a wonderful experience. The building team introduced a vaulted ceiling to the old extension taking full advantage of the ceiling height and adding velux windows to bring in more daylight. To create a lighter more versatile space the existing rooms were also significantly redesigned. This entailed knocking down a wall from the utility area, blocking up the back door, relocating a listed window and then adding patio doors where the old window was previously positioned. This immediately opened up the space with natural light and easy access to the garden for al fresco eating. 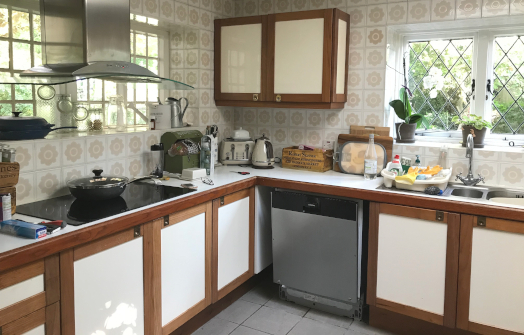 With the old kitchen and breakfast room now connected by removing a wall it was decided as part of the design solution to split one of the areas into two separate smaller rooms. One became a practical utility room and the other for refrigeration including wine coolers. These now become an extension to the kitchen but with the ability to hide everything away and give much needed additional storage. With a brighter kitchen our clients also wished to include breakfast bar to enjoy the stunning views of their garden. Taking the character of the cottage and blending it with stylish modern touches achieved the luxurious and airy kitchen our clients wished for. Modern kitchen units were chosen by Bauformat a premium German brand known for their sleek and timeless appeal. With a broad range of colours and textures available it also allowed us to mix a diverse two tone palette. The base unit doors were in anthracite concrete accompanied with white gloss wall units, these were less dominant and let light reflect from them. Built in Miele appliances were chosen throughout reflecting sleek design with the latest technology and convenience. The wine cooler was by Caple and the sink and taps by Franke, not forgetting extraction with the inclusion of a hidden Elica extractor. These helped create the clean uncluttered contemporary design required. Finishing touches of smokey grey glass splashbacks were added to coordinate with the overall colour scheme along with silestones’ white arabesque quartz worktops and marble effect floor tiles to connect each space. 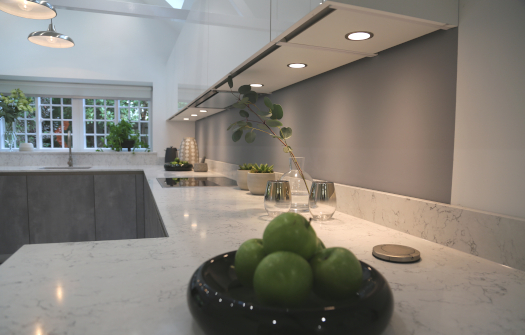 Our clients were extremely happy with the finished kitchen which has added a chic light and airy contemporary element to their character home. This is now a space which will not only be more enjoyable but also easier to use and spend time in. If you wish to renovate your kitchen why not pop into our showroom or call us on 01932 255465 where we can help inspire or guide you.